Looking back down onto town from the top of Snow King, with the late-autumn light painting the valley every shade of purple, the Exit Sensor Gloves let you snap a quick picture with your gloves on before the sun dips behind the Tetons. My husband loves his - I needed a pair too! Wisconsin/polar vortex/shoveling/dog walking/snowshoeing. All good. 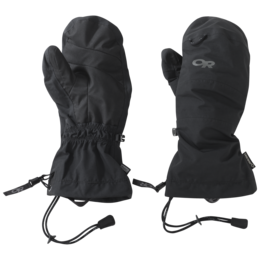 Takes a little while for gloves to dry once they have been used for a few hours. Just perfect for daily activities. Great woodsy look too! Full disclosure, I grew up in Alaska and have lived here for all my life (42 years). I would say I'm acclimated to Alaska winters and in general I find that I can tolerate fairly cold temps. 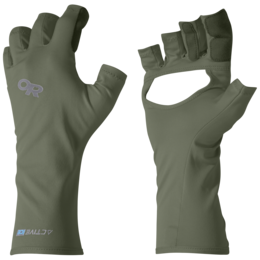 That being said, these gloves are outstanding. 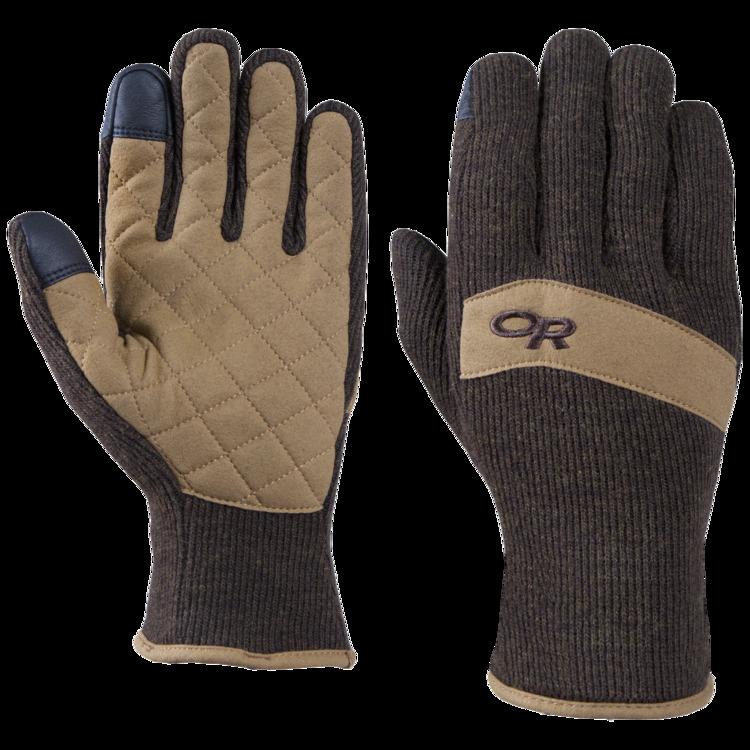 I like that they are thick and insulated without being too bulky, I can wear them to pump gas, split wood, etc and have the dexterity to do most outside winter tasks. 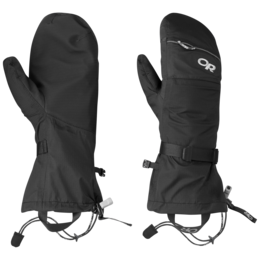 The wrist portion is nice as the glove doesn't just end at the palm of your hand, but gives some coverage so that your coat can tuck over the glove. The touch screen sensor is a great feature as well. 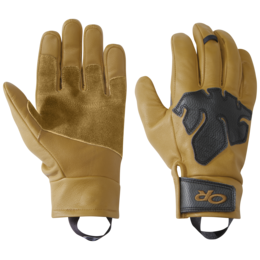 The leather palm is very durable and has stood up to some wood splitting sessions. I recently took my dog for a walk at -15F for 30 minutes and my hands did not get cold. 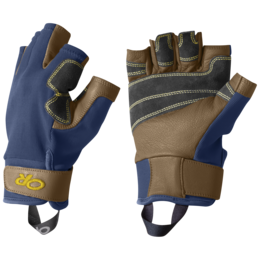 I have another review that said the wrist opening was tight to slide your hand into, but the gloves have nice loops to help assist with putting them on and I don't find this to be an issue at all. 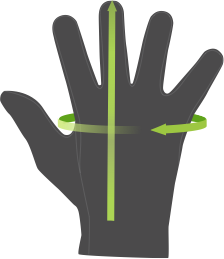 I recommend reading the sizing chart and measure your hand in order to correctly get the right size for your hands. 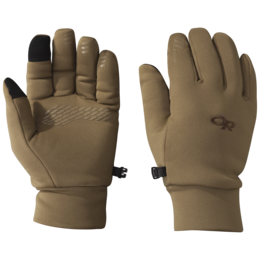 i've bought these gloves maybe 4 times now. they are warm & good for active activities. the pull on strings rip out so be especially carefully the first 100 times you use them or that will rip off. if you fall down in the snow it sticks. 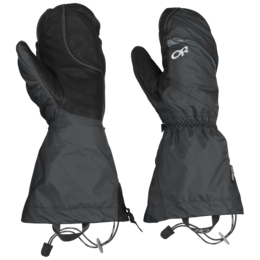 but they are great for warmth, travel, around town if you live in ketchum, idaho etc. 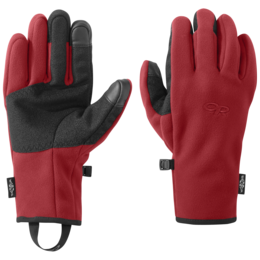 I use these gloves when working outdoors in the garden or related farm work, in moderate winter temperatures (20's and up). 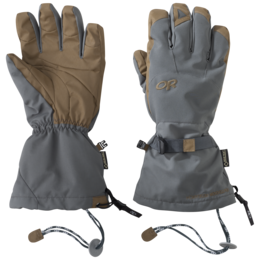 They are a good mix of insulation, flexibility, water & wind resistance. Outer fabric is tough. 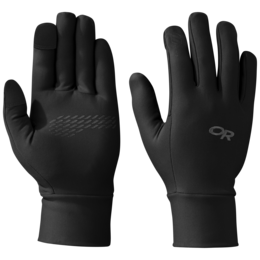 Needed a new pair of gloves for winter. 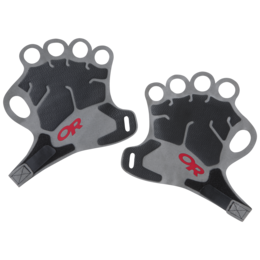 Basically use these for driving and kicking it around town as well as walks / hikes with the dog. They do all of these well! 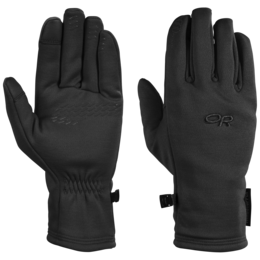 One it gets down into the 20's I prefer my OR mitts. 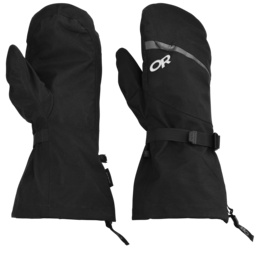 These gloves are just so-so. They look stylish but were thicker than I expected. And, despite this thickness, they are not very good at keeping the cold out. Anything flirting with 0 celsius and you're in trouble after 10 minutes. 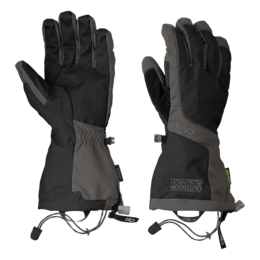 I can't recommend these gloves... hard to believe that other reviewer's went climbing using them... they would be drenched in no time. 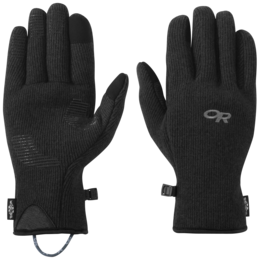 These are easily the most comfortable pair of gloves I've owned. They are nice and warm to boot. Grip is decent, but not technical. I also really like the look. 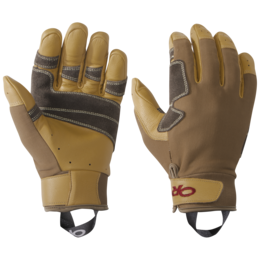 The negative is that the "hole" to the glove is stiff and inflexible. This makes it hard to get your hand in. Luckily OR thought of that by adding attractive pulls. The problem is that after the third time I slipped these babies on, the left pull broke off. I did not think I was pulling that hard. 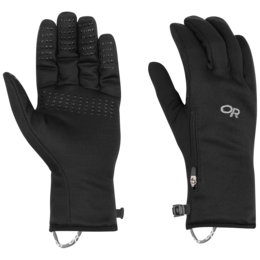 These beautiful and comfortable gloves are marred by an overly difficult access. 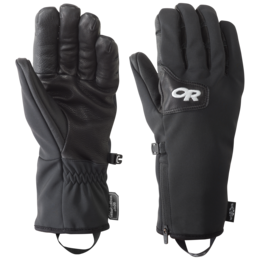 I purchased these for a climb up Mt Bierstadt and Evans, and they were much warmer than I expected. 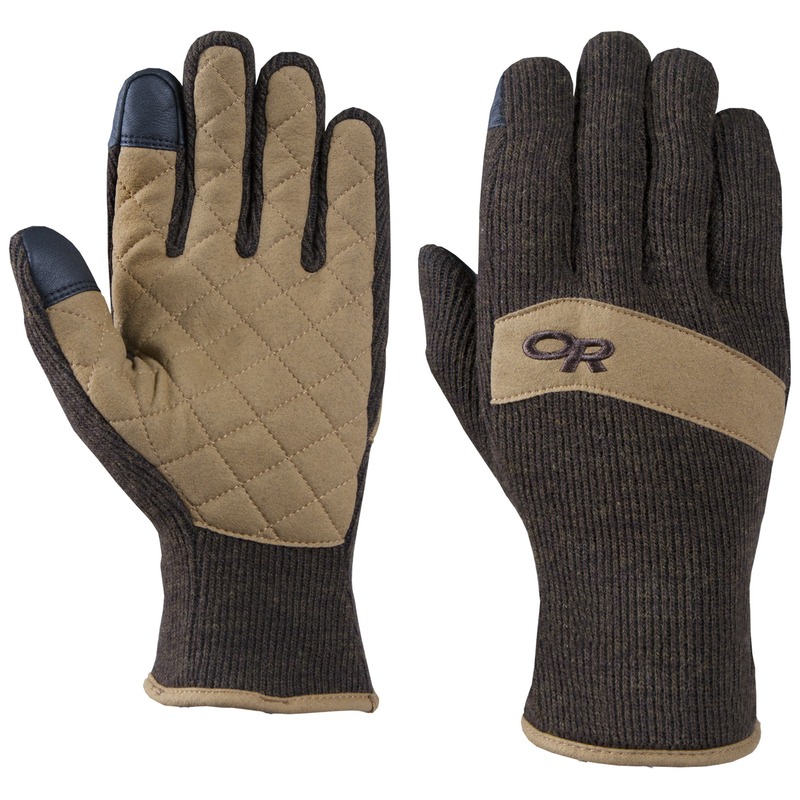 I usually have sweaty hands which quickly get my gloves wet and cold, but these seemed to just wick moisture away. When I fell in deep wet snow, I was concerned they would be wet for the rest of the day, but they seemed to dry out fairly quickly. 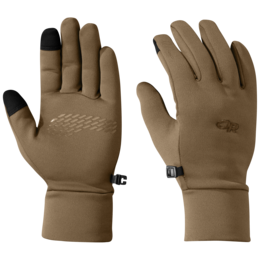 The packaging lists these as 40 degree gloves, but that must be when you're idly lounging, I found these to be warm in mid 20 degree windy weather. 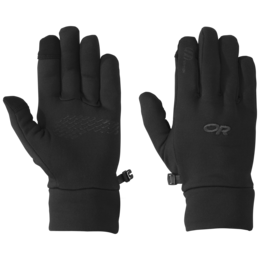 One complaint is they are tight fitting, which makes it difficult to put these gloves on at altitude when your hands swell. 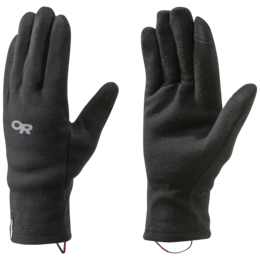 While the touch sensor finger tips work well around the city, they don't seem to work as well when the gloves get colder and are only really good enough to switch through menus, but not effectively type on your phone.